Advanced Graphics London comprises of a studio, specialising in screenprinting and woodblocking techniques, and a publishing department selling original limited edition prints, paintings, drawings and monoprints. 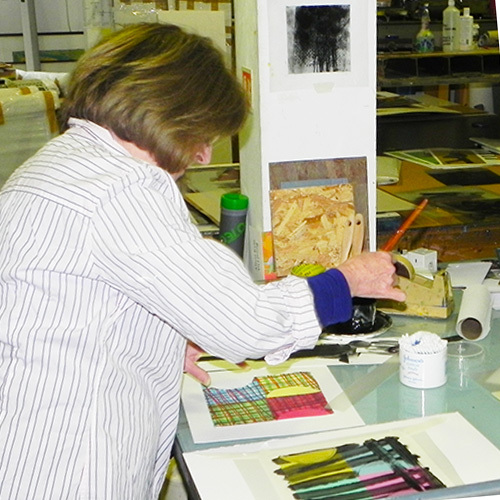 Also, we are proud to represent and exhibit the letterpress prints of Alan Kitching and the complete Tim Mara Estate. Please use this online catalogue to view the work we have published since 1967. Please contact us by telephone or email for more detailed or specific information. The little office and showroom is based at 68 Walcot Square, London, SE11 4TZ. Please call or email before visiting in case we are at the studio where the prints are made.